An apple doesn't fall far from the tree. So if you don't like apples, trees won't like you either. And the other way around. If your mother ate apples during pregnancy, she might have protected you from asthma. And if you like apple juice, this might help you avoid chronic wheezing issues. Research has already proven these and many similar connections. Now a new study suggests that eating apples could also help you cope with seasonal allergies - particularly with allergies to birch pollen. And vice versa - a birch pollen therapy can help you tolerate apples. Allergies affect many people in westernized countries. 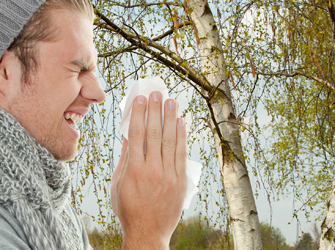 10-15% of the population in North America and Europe suffer from immediate allergic reactions (type I), and birch pollen is a considerable cause of seasonal allergies. Its major allergen Betv 1 (responsible for more than 95% of allergies to birch pollen) can cross-react with Mal d 1 - the main allergen in apple. Thus during the pollination season, people sensitive to birch also might be sensitive to apples. But as Swiss and Slovenian scientists showed this year, just a piece of apple - 1-128 grams per day can help Birch-sensitive individuals to prepare for the allergy season. And it can increase their tolerance to apples - to the extent they can eat an entire apple per day after the treatment. Unfortunately, subsequently cutting apple intake means that birch allergies will return. Another recent study by Japanese allergists showed that injections of birch, ragweed and cedar pollen helped a highly allergic person tolerate apples. She could increase her intake from 3 grams (which is a tiny piece the size of half of a grape) to 50 grams, which is almost a half of an apple! Allergy symptoms to most other fruits and vegetables also improved or disappeared. What is your relationship with apples and trees? Aurametrix can help you track your food sensitivities along with seasonal allergies, finding what combinations and amounts are right for you. Okoko BJ, Burney PG, Newson RB, Potts JF, Shaheen SO. Childhood asthma and fruit consumption. Eur Respir J. 2007 Jun;29(6):1161-8. Epub 2007 Feb 14. Miyake Y, Sasaki S, Tanaka K, Hirota Y. SAllergy. 2010 Jun 1;65(6):758-65. Epub 2010 Jan 22. Consumption of vegetables, fruit, and antioxidants during pregnancy and wheeze and eczema in infants. Hokkaido Igaku Zasshi. 1994 Nov;69(6):1409-26. [Clinical and immunological analysis of Birch pollenosis]. [Article in Japanese] Takagi S. Source Department of Otorhinolaryngology, Hokkaido University School of Medicine, Sapporo, Japan. hmmm... I have birch pollen allergy, but have also developed an oral sensitivity to apples/plums/filberts etc so can't eat them anymore! My doctor advised me to eat more fruits to fix my sleep cycles . That’s why apples became part of my everyday life..
thanks for posting this blog. this blog is good quality blog. I like it. good Peggo APK file provided here. Click on the APK data Peggo APK like to know that it's not officially readily available in nice. good results to your targeted video clip. I can state, you Musical.ly Online and much more fun to utilize than Dubsmash you can not nice. These days, everything about a company matters and it impacts its image, employees’ productivity, efficiency and such. Some people might believe that office fit out central London is just an excuse to refurbish the existing space, but the truth is that there are many advantages to this decision. Office refurbishment London might require some downtime, but if you manage to find a specialized company, you can rest assured that they will met the given deadline, meet instructions, safety regulations and such.